On this occasion, my guest and I choose to sit at the counter which gives us a bird's eye view of the chefs. We start off with a selection of starers from the Chef's Menu. 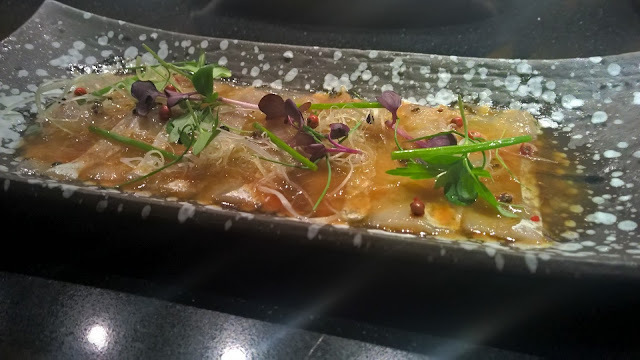 The Yellow tail carpaccio is served in ponzu sauce, which in itself is nothing new, but ponzu jelly adds a light texture to the dish. Next up, I have the Seabass Carpaccio, and as much as we liked the Yellowtail, this tops it. 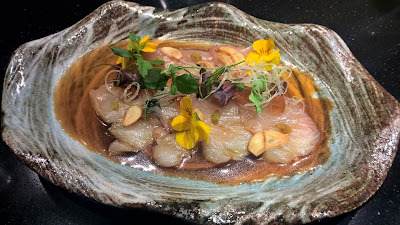 Firstly, it is uncommon to have sea bass served in this way, so the novelty excites. Then, the flavours. Rose pepper and truffle oil brung beautiful flavours to the dish - as the dish is served, you will get a whiff of that truffle oil. 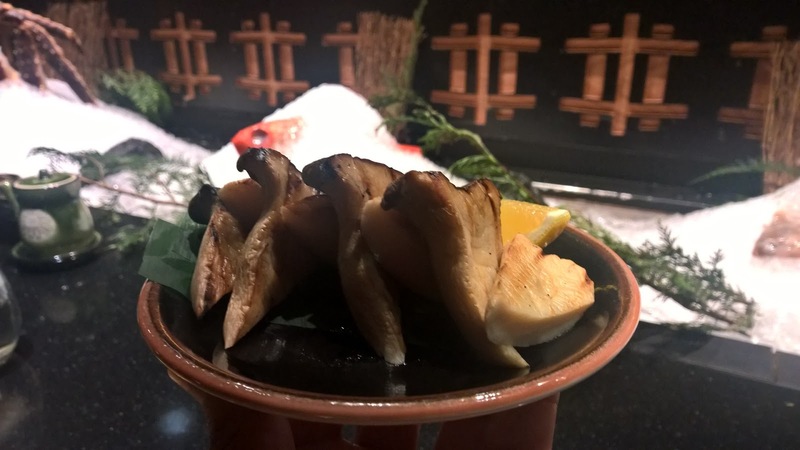 However, it is used sensibly, so I can still enjoy the naturalness, if you will, of the sea bass. Encouraged by those fabulous starters, my guest and I order a couple more starters - we like the portions. The Wagyu beef tempura rolled in kataifi, the main ingredient in kunafa - you know the one that has that bird's nest appearance and is very crispy? That is the quality that it brings to the wagyu tempura - wagyu pieces cooked at the right temperature are nicely contrast with the kataifi texture. We also have the Octopus - no rubber texture here. It is tender and lightly crispy on certain bites. Finally, the Dynamite rolls, which mark a change from the ubiquitous dynamite prawns that are so common these days. Instead, Chef has used salmon which he has deep fried and worked into a roll with Japanese pickle radish and sweet potato - he tops it all with crab meat. All three - Highly recommended! 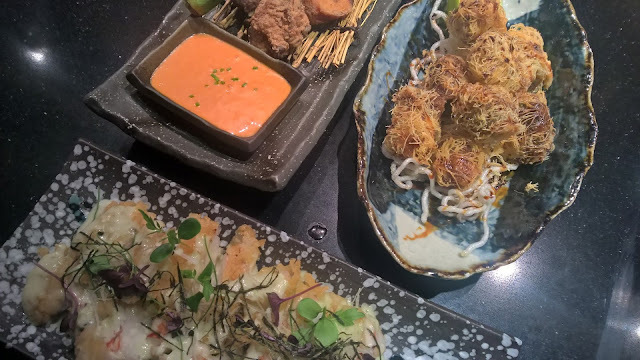 If you have ever been to an izakaya in Japan, you would notice of course that it is much less formal than Inakaya here in Abu Dhabi, but what they both have in common is an element of liveliness. 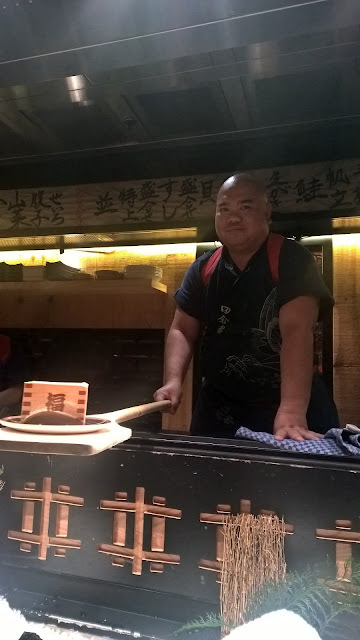 The pounding of the mochi, a glutinous rice based treat that can be had sweet or savoury, is something to behold as staff pound in tandem. 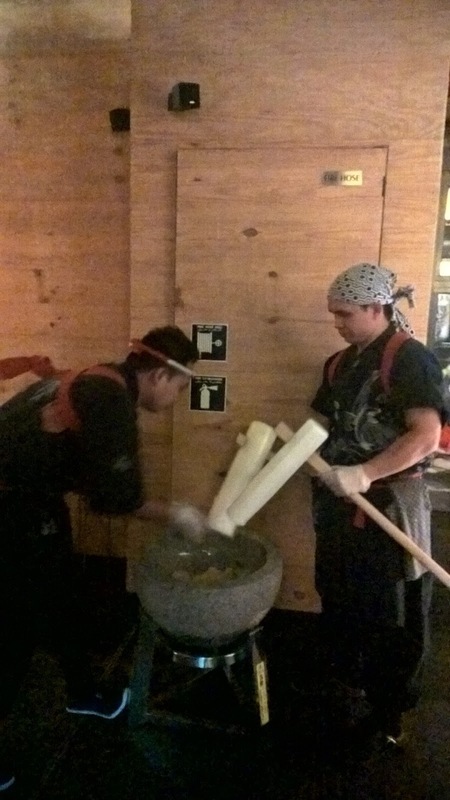 Great fun, but much less corny than the tacky 'entertainment' that one sees at Americanised sushi establishments. This is real. 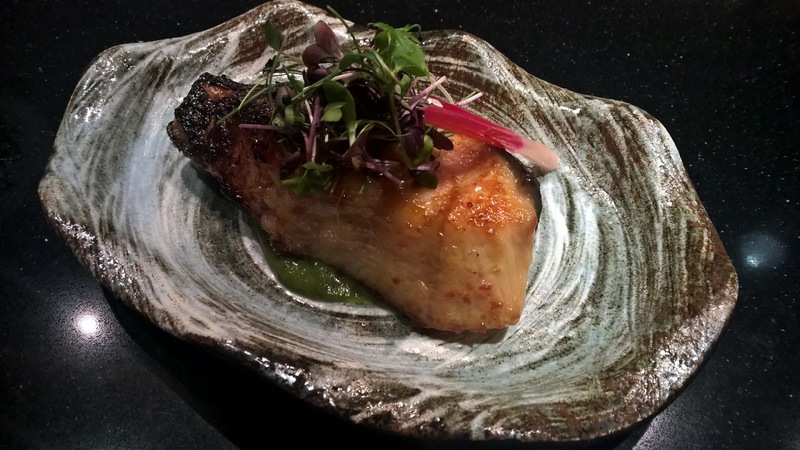 My dish of the night is reserved for the Black cod fillet cooked with basil and miso sauce. It has become a staple of mine and two or three restaurants, and I am happy to add this to that group. Japanese plumb glaze, instead of the usual miso glaze, makes it a special piece of fish - you will love that mildly sweet and sourness on the cod! 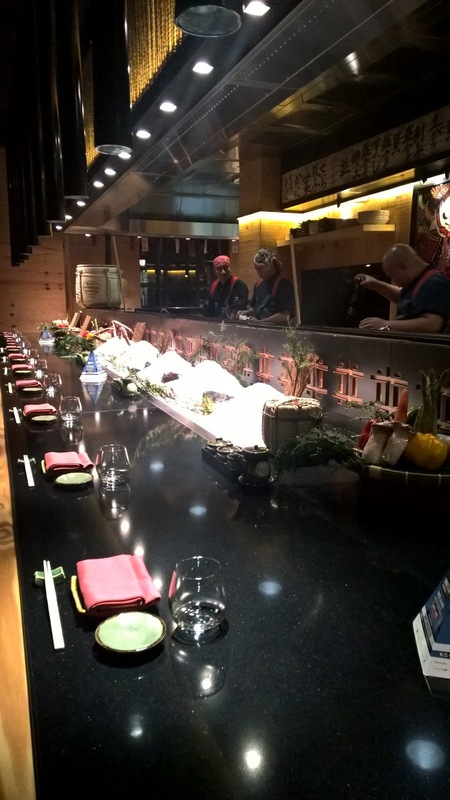 Sake is served in a typical Japanese style in a masu that overflows. Inakaya is a Japanese experience with a difference. You were never going to get an authentic looking and izakaya restaurant in a city where people are obsessed with fancy, and the restaurant recognises that, compromising by giving you a similar feel but in a more elegant setting that remains super casual nonetheless! 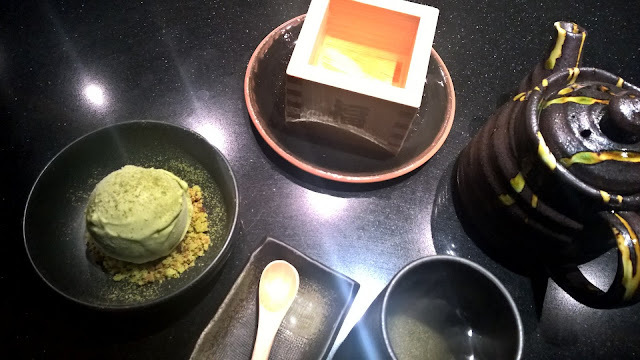 Fine ingredients, attentive service and a quirkiness make Inakaya different to other high end Japanese restaurants in the city. Furthermore, the fact that it is not part of a hotel makes it an even more desirable venue. Finally, the winter months offer something even more special with outdoor seating offering sumptuous views of the canal. All in all, a great night out. Disclaimer: I visited Inakaya courtesy of the the restaurant.